Grower Irene Burkart sells her Giant Fuya persimmons at the Santa Monica Farmers' certified Market. 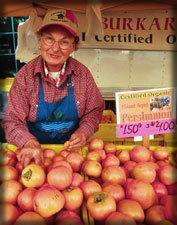 Southland takes pride in the certified that is associated with its farmers markets. Like other consumers, you may wonder what value a certified farmers market has to offer. Since not all markets are certified, it is important to understand the added confidence that comes from choosing to shop at markets that have that designation. Do you really know where your fruits and vegetables come from? Certified products are grown or processed in California by the farmer who sells them to you. Products may not be brought in from another state or imported from outside the country. You wont be able to find pineapples or mangos at a certified market, however, California-grown sub-tropical fruits as they come into season can be very tasty: persimmons, Asian pears, and more. You wont find all varieties of produce year-round  only when theyre in season locally. To ensure fresh and healthy produce, there are strict guidelines the growers must follow to be certified. Each grower must obtain a certificate, issued only after inspection by the California Department of Food and Agriculture, which must be presented to the market manager. It specifically lists the produce the farmer is growing. The state ensures that quality control and health standards are maintained in fruits, vegetables, eggs or any other food products that are offered for direct sale to consumers. Knowing where your food comes from is important, but ultimately its freshness and taste that count. Since produce can lose nutritional value and flavor after being picked, the best way to get the freshest produce is to shop at a certified farmers market.